Homeslice might also be the best pizza in the UK. SO so good. My boyfriend works in the area and it was recommended by almost all of his workmates, so he checked the base and the sauce was vegan (it was) and we went along one evening after work. There was a waiting list (always a good sign) about 30 mins long, so we went for a quick drink. They even called us when there was a table available. The restaurant is really cool - long trestle tables to share, laid back and funny waiters, with an open fire oven where you can see the pizzas being made. 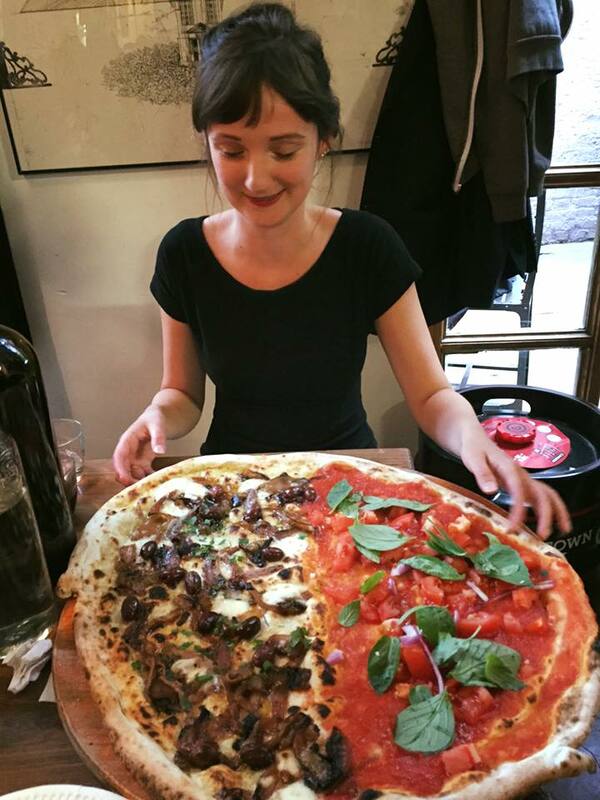 The idea is you can either order slices of pre-made pizza or an entire customisable pizza for £20. This was perfect, as I didn't have to subject my pescetarian boyfriend to no cheese. I had 1/2 a caprese with no mozzarella (so tomato sauce, tomatoes, onion, garlic and basil) and Luke had 1/2 caramelised onions, olives and anchovies. We also ordered red wine, which they sell in a very clever way. They put a massive bottle on your table and only charge by the glass, which they measure at the end with a stick. Very tempting! Good as we didn't have to keep catching the waiter to order more, bad as you may end up drinking too much. The pizza was as big as the table! HUGE! We were given paper plates to eat from and it is all hands on. Things get messy! But oh BOY this was the best pizza I had ever had in the UK (first place goes to Almalfi, Italy) Thin crust, loads of delicious sauce and the most fragrant fresh basil I have ever tasted. It was sublime. Neither of us finished it but we took home the spare slices in a bag for lunch the next day - where it was equally brilliant!